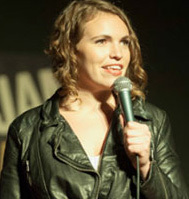 Beth Stelling, is a 2007 Miami Theatre grad, returning to campus to perform over Homecoming Weekend! Her quick-witted humor and talent as a stand-up comedian, writer and actress has landed her feature spots on Conan, Jimmy Kimmel live, Comedy Central's @midnight, Chelsea Lately and The Pete Holmes Show. A 2014 honoree of Miami's 18 of the Last 9 Alumni Award, Beth was named "Best Stand-up Comedian in Chicago" by The Chicago Reader in 2010.